Parrot tulips look similar to other tulip varieties with one major distinguishing feature — their frilly petals. 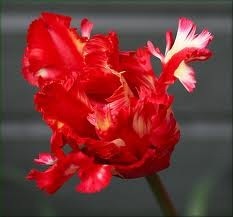 Parrot tulips characteristically have feathery, twisted or scalloped petals instead of the traditional rounder petals. Parrot tulips’ colors range from the traditional red, pink, and yellow and expand into more unusual colors such as bluish-purple, golden, apricot and multi-colored blooms with stripes. For example, the ‘Fantasy’ parrot tulip is a soft rose color with apple-green stripes, and the ‘Texas Flame’ red and yellow-bloomed. Many parrot tulips have a greenish dot at the petal base. In addition to the unusual shape of the petals, parrot tulip petals open up as they are exposed to the sun, and may almost completely flatten if left in the sun long enough. Considered "perfect flowers," tulips contain both male and female reproductive parts. The anther and filament of the tulip represent the male part, and the stigma, style and ovary represent the female part. As with other tulip varieties, parrot tulips have long, slender stems. Parrot tulips commonly grow between 12 to 28 inches tall. 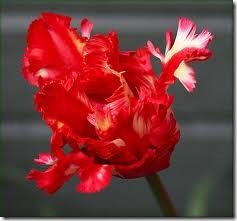 Like other tulips, parrot tulips are grown from bulbs, not seeds. « Does a Tulip Tree Like Full Sun?